Kate is a beautiful black greyhound who was born in December 2009 and has a nice nature. The day after she arrived here she came into season so will not be spayed until the middle of January. This is something we will arrange with any potential new owners should she be re-homed before then. 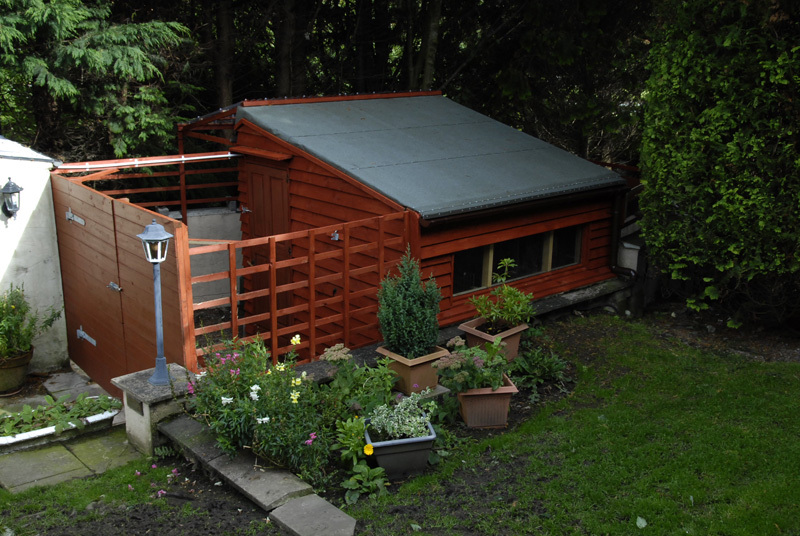 * The branch kennel at the bottom of our garden is where Kate and the other resident(s) will be for the first day or so until he gets to know the other greyhounds. He has use of our garden and paddock, and once he gets to know the other dogs he will be allowed in the house during the day and all the dogs will then take it in turn to sleep in the house at night, so they become use to sleeping in both the kennel and the house. This evening we met Kate's trainer part way who handed her over along with Maisie. Both settled quickly in our branch van and took the journey home in their stride. Once home we put them both in the kennel in separate sections and allowed Tyler and Buster to roam the rest whilst still able to say hello to the new arrivals. Kate has been living in the kennel with some others since she arrived because of the number of greyhounds currently living in the house, and re-homings being slow with Christmas on the way. The weather has been quite bad recently and Buster is NOT happy about being in the kennel such a lot, so we decided to allow him in the house a little during the day. If we did it would not be fair to leave Kate in the kennel on her own, so she would come in as well. used to them being in the house. They loved it, and before long were fast asleep on the dog bed in front of the kitchen fire. After they had their tea, they did their toilet then it was back in the kennel for the night, which didn't bother Kate at all, she just trotted down there and settled in her bed. Well Kate might not like sharing her bed in the kennel with another dog, but tonight she is fast asleep on the dog bed in front of the kitchen fire alongside Buster. They aren't touching, but are both on the same bed. Nigel arrived again today to walk some of the dogs, and on one of the trips he took Kate and Buster out together. Kate pulled quite a lot on her last walk so we put a harness on her and she walked much better. While out walking they saw a dog in the distance and Buster barked at it causing Kate to freeze in her tracks. Refusing to move she stood shaking so badly that Nigel phoned us and Stuart went in the car to bring her back. Back home she was her happy little self and Nigel, when he got back with Buster was amazed at the difference in her. From the way she reacted we can assume she is not used to the big 'outside world' and all it offers, so we will show her over time there is no need to fear and plenty to enjoy. Unlike yesterday afternoon when Kate wasn't too sure of the house and stayed at the top of the kitchen steps leading into the guest sitting room, which is the favourite spot for the majority of new dogs arriving in the house, tonight, she settled instantly and chose the spot in front of the fire where she stayed most of the evening without so much of a peep. Kate went out for a walk today with Nigel and Hazel and although she 'froze' to the ground when she saw some sheep, allowing her to watch them along with a little coaxing saw her this time walking forward again - a big improvement! This afternoon Craig, who has been walking the greyhounds each week since the beginning of December following the loss of his whippet called in today with his family so they could meet Kate. Having met Kate and taken her for a walk they asked if they could adopt her. 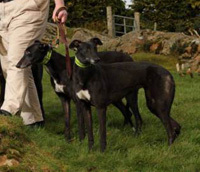 This they did, and off she went with them to her new home where we hope she has a long and happy life. He emailed later to let us know that Kate has been out, had her tea, and is now doing what Greyhounds do best - she is fast asleep by the fire !!!! We heard today that Kate has made herself right at home, she is improving every day and getting very good at being part of a family !!!"